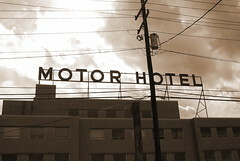 Thank you mojavegirl1216 for letting RRBJ use Motor Hotel Shreveport LA as a Picture of the Day. didn't you use this as a picture of the day before? Back in June, we used one that was a different picture of the same sign. At the bottom of this post click on the words Picture of the Day and you'll be treated to all the pics in this category. We've got some interesting things to document in SB Land. Scott Griffin did an excellent one of the other side of that sign.